Many homeowners choose to extend the indoors outside, turning backyards and patios into lively and welcoming living spaces. From BBQ islands to fire pits and pizza ovens, here are 7 great tips for creating your perfect outdoor kitchen. 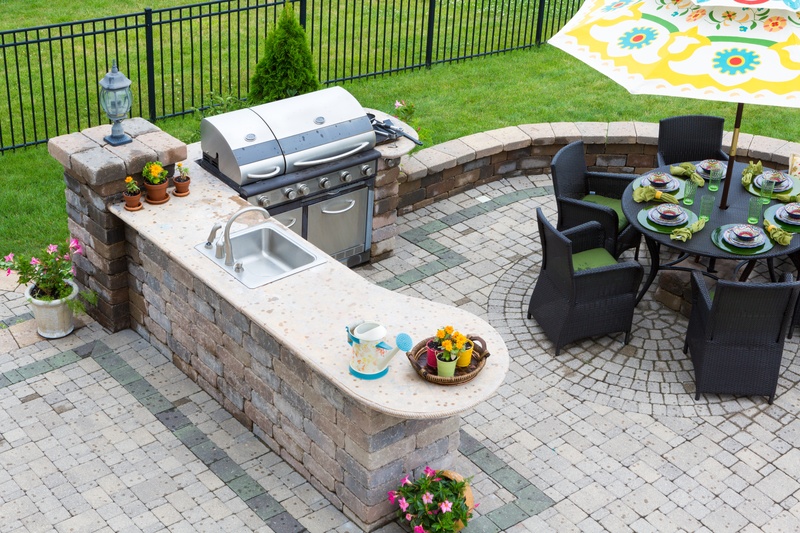 Just like your indoor kitchen, an outdoor kitchen requires a layout planned in advance. Top priority should be flooring, which adds durability and value. What kind of entertaining will you be doing? Safety is an important factor, especially if there will be small children running around. Since many outdoor kitchens in Las Vegas are located near swimming pools, stay away from slick or slippery surfaces. How far away from the main house do you want it to be? Do you have a view from the house or deck you want to maintain? Consider placing the grill a good distance from where people will be seated. Makes sure you have enough space for the appliances you want. Use the same triangle method as indoors: the sink, cook-top, and refrigerator should be no less than 4 feet and no more than 9 feet apart. Be sure to leave space on both sides of the grill to accommodate cooking tools and platters. Many homeowners choose a grill, sink, and small refrigerator. Others take it up a notch with specialty items like pizza ovens and beer taps. Whatever you choose, make sure they can withstand temperature changes and the hot sun. Stainless steel and ceramic are great choices. Will you be using the kitchen year round? The outdoors is not the place for storing things out in the open, so plan on plenty of storage. Unless it’s completely undercover, the storage needs to be waterproof and should be durable. An outdoor kitchen offers family and friends all the comforts of the indoors for enjoying the beautiful Las Vegas weather. One of the best ways to create a comfortable environment is by installing exterior shades. Our ZipRite shades lets you enjoy a whole new outdoor room with the simple push of a button. They’re perfect for keeping the patio cool during hot summer days, and protect your furniture from the sun’s harmful rays. Just keep in mind that for safety reasons, your BBQ should be placed outside the Zip-Rite shade. Outdoor lighting creates a beautiful ambience and lets you safely cook, even in the dark. Step lighting is ideal if you have multi-level seating areas. Remember to place the grill or cook-top far enough away from your home’s entrance – it’s also a great way to keep foot traffic away from potential hazards. For more information on Zip-Rite shades or any of our exterior shades and awnings, call Polar Shades at 702-260-6110 for a free in-home consultation.